One of the most advanced water theme parks ever designed, the five-hectare (12-acre) water park at Wild Wadi offers families and thrill seekers hours of fun, relaxation and adrenalin-pumping action. Designed like an Arabian wadi (oasis), the park has an Arabian folklore theme and features some of the highest and fastest water rides outside of North America with 24 state of the art, high-adrenaline rides and slides. Rides for thrill seekers include Jumeirah Sceirah, a 108ft (33m) free-fall at 50 miles per hour (80km/hr), Master Blaster slides that are water roller coasters propelled uphill by high-powered jets, the white-knuckle ride at Rushdown Ravine or the high waves at Breakers Bay. Opening times: Open daily from 11am. In January and February it closes 6pm; March to May 7pm; June to August 9pm; and September to December 5pm. Admission: AED 215 (age 13+); AED 175 (children 4-12); reduced admission after sunset. 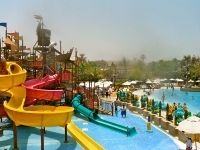 For individuals staying either at the Jumeirah Beach Hotel or Burj Al Arab, access to the Wild Wadi Water Park is free.